WASHINGTON -- Growth in factory activity slowed more than expected in September even as private sector job growth accelerated, signs of an uneven expansion in the U.S. economy. The Institute for Supply Management said Wednesday its index of national factory activity dropped to 56.6 last month, its lowest level since June. A reading above 50 indicates expansion. Analysts have been warning U.S. factories could feel a chill from soft demand in the global economy and from recent strength in the U.S. dollar, and the ISM data could be an indication of this. Still, U.S. factory growth remains historically strong and the wider economy appears to have shifted into a higher gear. 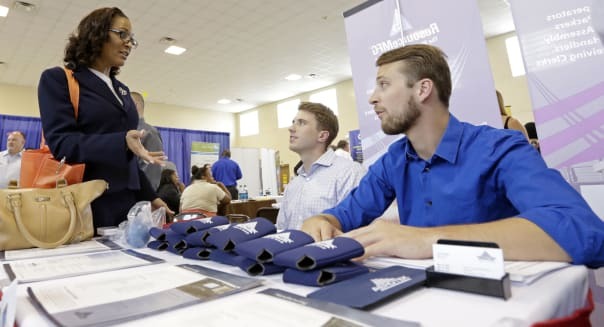 A separate report from a major payrolls processor showed U.S. private employers added 213,000 jobs in September, just above economists' expectations. "It still looks as though overall GDP growth in the third quarter was around 3.5 percent," said Paul Dales, an economist at Capital Economics in London. U.S. Treasury yields fell as data from the U.S., Europe and Asia showed the factory sector faltering, while the dollar slipped. U.S. stocks, which opened lower on concerns the first diagnosis of Ebola in the United States could curb air travel, extended losses after the manufacturing data was released. The slowdown in U.S. factory growth last month follows an August reading that had been the strongest since March 2011, leading some analysts to downplay the significance of the September reading. "This is still a very strong reading by historical standards," said Ian Shepherdson, an economist at Pantheon Macroeconomics. Separately, the Commerce Department said U.S. construction spending fell in August, hit by weaker private spending outside the housing sector and a pullback in public investments. Construction spending dropped 0.8 percent to an annual rate of $960.96 billion. Economists polled by Reuters had forecast construction spending increasing 0.5 percent in August. The surprise decline was largely due to a 1.4 percent drop in money spent on private nonresidential construction, although outlays fell across the board with state and local construction down 0.9 percent. Private spending on housing fell only 0.l percent in August, which is unlikely to unmoor expectations of an ongoing recovery in the housing market. -With additional reporting by Michael Connor, Rodrigo Campos and Richard Leong in New York.